The latest education export data from the Australian Bureau of Statistics (ABS) further highlights substantial growth in the country’s international education sector this year. ABS estimates the export value of international students in Australia at AUS$28.6 billion (US$22 billion) for 2016/17. This represents a 16% increase over the year before, and reflects student spending on tuition, accommodation, living expenses and travel during their studies. 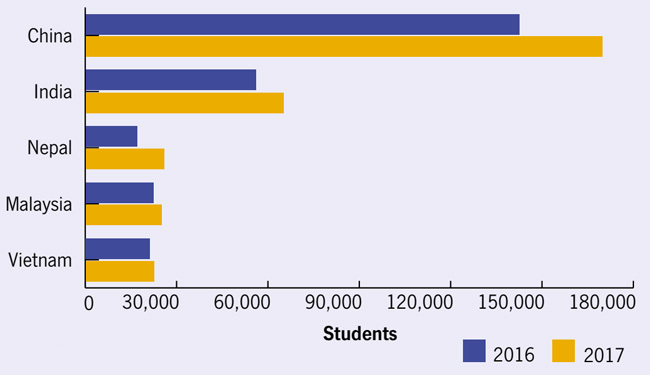 This overall value also captures student spending in transnational education programmes. As far as that goes, there will always be some debate around export estimates in the sector, and stakeholders have often observed that the official ABS values tend to understate the actual economic impact of international education in Australia. Last year, for example, a related analysis from Deloitte added another AUS$1 billion in spending to the official ABS estimates for 2015/16. The additional funds attributed by Deloitte pertained to short-term language studies, tourism spending by visiting friends and relatives, and revenues related to offshore campuses. Even so, the overall valuation of the sector for 2016/17 is the latest indicator of double-digit growth in Australian international education again this year. The latest data from the Department of Education and Training counts 577,353 foreign students in the country for year-to-date August 2017. This represents a 14% increase in student numbers compared to the same period for 2016. As the following graphic reflects, the top five sending countries for Australia – China, India, Nepal, Malaysia, and Vietnam – are holding steady this year, with China again a major factor in driving overall growth. Taken together, those five source markets account for just over half (53%) of all international students in Australia this year. Also in keeping with recent-year trends, Australia’s higher education and vocational education and training (VET) sectors are fuelling much of the overall growth in student numbers for this year. As indicated in the chart below, both sectors are tracking just above overall growth rates for the year-to-date. The relatively modest increase in ELICOS numbers noted here, however, understates the actual growth in the sector in recent years. As we reported recently, ELICOS student-weeks increased by 10% between 2015 and 2016. This reflects in part an underlying change in the enrolment base for Australian language programmes and increasing numbers from the Americas in particular. This entry was posted in Australia, Australia/Oceania, Most Popular, Regions and tagged transnational education, international student enrolment in Australia, universities with international students, prep schools with international students, student recruitment.